Do you give your kids’ teachers a “Welcome to the new school year” gift? I wasn’t consistent about it, but there were a few years where I felt like getting on the teacher’s good side was in the best interest of my very loud daughter. Besides that, I firmly believe teachers aren’t paid what they’re worth and a show of appreciation never hurts. I’ve covered a couple of versions of the coffee cup sleeve, but this one got into my head and wouldn’t leave. Now, I’m glad it wouldn’t…I love how this turned out! 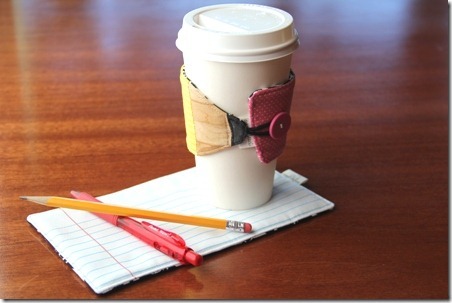 To make the Pencil Coffee Cup Sleeve, you’ll need this pattern. There is a very good reason why all the writing is backwards on the second page. It’s because I forgot that the back needed to be cut the opposite direction as the front. Use it as shown and ignore the writing. It happens. Cut each piece as shown from cotton fabric. I’m using InsulBright for this project, because it only requires one product for the inside lining instead of two like my previous drink sleeves. Make sure you let the recipient know that, due to the metal in InsulBright, this should NOT be put in a microwave. You’ll also need a pink button (5/8 – 3/4”) and half of a black hair band. Make sure the ends are tied together with some thread. 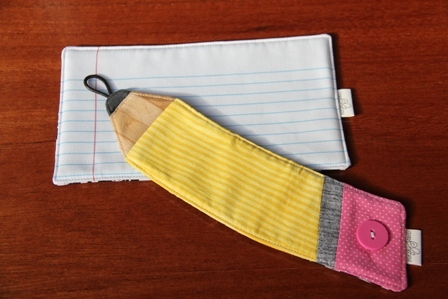 Sew each of the pieces of the pencil to each other with a 1/4” seam. Press seams toward the eraser end. Layer the pieces with the pencil right side up first. Lay the hair band with the loop facing in, centered on the tip of the pencil. Next, carefully lay the back piece on top, right side down. Lay the InsulBright on top of that and pin everything in place. 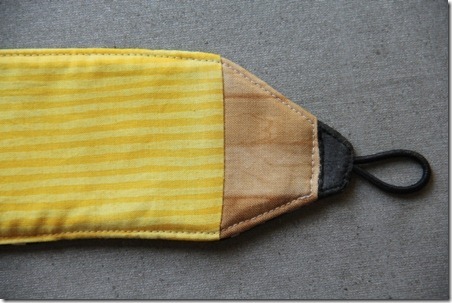 Stitch around with a 1/4” seam, leaving a 2” opening at the bottom for turning. Clip corners and turn right side out. Press, turning in opening. Top stitch all the way around near the edge with white thread, stitching across just below graphite tip. Top stitch the tip in black. Touch the tip of the pencil to the end of the eraser. 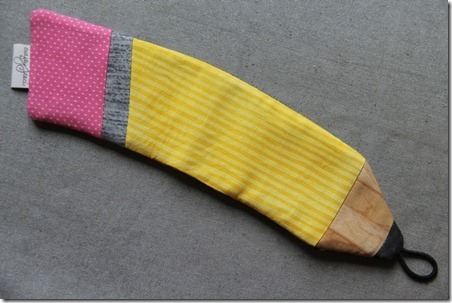 Stick a pencil in the loop, pulling it firming but not stretching the elastic and make a dot to mark for the button. There’s only one button because I didn’t make this one reversible. Stitch the button in place, sliding a toothpick underneath. Wrap the thread around under the button before knotting. To make the mug mat, I printed a piece of fabric to look like notebook paper. 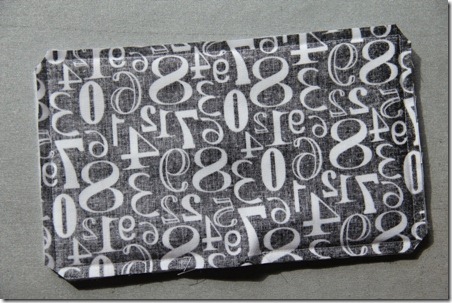 Simply iron an 8 1/2 by 11” piece of white cotton fabric to the shiny side of a piece of freezer paper cut to the same size. 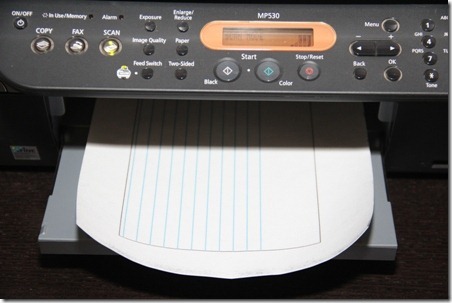 You can, carefully, feed this through your printer. My disclaimer here is that it has always worked for me, but you are taking your chances with your printer. 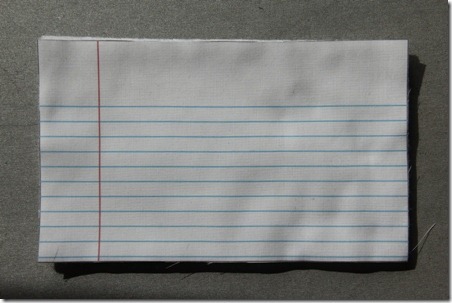 You can find the notebook paper printable I made here. 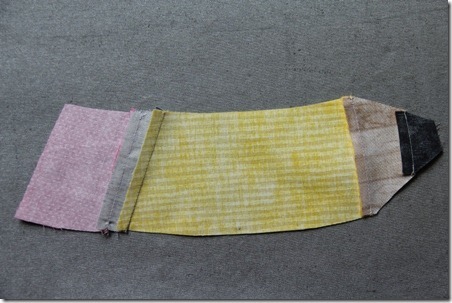 Peel the fabric off the paper. There are lots of ways to set the ink into the fabric, making it less likely to fade, including salt, vinegar and some products you can buy. I pressed mine with a very hot steam iron. Cut out around the black line. 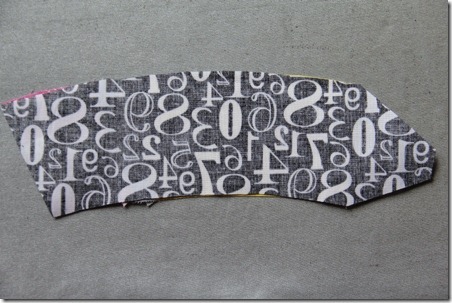 Use this piece as a pattern to cut out the backing and InsulBright. You could use regular fleece or batting inside, because the insulating properties of InsulBright aren’t needed here, but since you’re already using it for the drink sleeve, it’s just convenient. Ordinarily, a mug mat would have some kind of pretty binding around the edge. Today it doesn’t. I could say I liked the look of the paper better that way, but honestly I’m just not good at it and didn’t want to torture myself today. Layer the pieces, starting with the InsulBright. Lay the front, right side up, on top. Finally, lay the back over that, right side down. Stitch around with a 1/4” seam, leaving 2” open at the bottom for turning. Clip the corners. Turn right side out and press, turning in the opening. Top stitch around, close to the edge. Now you’ve got a cute set to bribe the teacher with so little Suzy doesn’t have to spend every recess writing “I will not talk in class” on the board. That probably won’t work, but her teacher will know how much you appreciate her patience. My daughter is still loud, but she’s old enough to manage it these days, so I’m listing this set in my Etsy shop. You can find it here…just in case you run out of crafting time before school starts. Visit Finding Pins and Needles on Etsy for a personalized embroidery pattern to add to your Pencil Coffee Cup Sleeve! Your kids' teachers will love it!